Published: April 2, 2016 at 04:21 p.m. Updated: April 2, 2016 at 05:11 p.m.
A number of notable 2016 NFL Draft prospects worked out at some smaller pro days recently. Representatives from 12 NFL teams were present for Navy's pro day on March 18. The main attraction was record-setting quarterback Keenan Reynolds. Unfortunately, due to a hamstring issue, Reynolds was unable to complete his workout and held a second pro day on March 30. Reynolds -- 5-foot-9 1/2, 190 pounds -- had a 37-inch vertical jump, 10-foot broad jump and did 15 reps of 225 pounds on the bench press. However, while running a 4.57-second 40-yard dash, Reynolds tweaked his hamstring and that ended his pro-day workout prematurely. So, 12 days later, Reynolds was able to continue with his positional workout, during which he worked out at quarterback, running back, defensive back and as a slot receiver. The position that best fits him in the NFL is as a slot receiver. Reynolds is described as a rare person, even among all of the rare people who get their education at the Naval Academy. Reynolds has off-the-charts leadership abilities. Representatives from 11 NFL teams -- including a special teams coach from the San Francisco 49ers -- were on hand for Liberty's pro day on March 23. A total of eight players worked out outdoors and on FieldTurf. Quarterback Josh Woodrum -- 6-3 1/8, 225 -- had such a good pro-day workout that two teams have scheduled workouts. Detroit Lions quarterbacks coach Brian Callahan came in to work out Woodrum on March 31. The Atlanta Falcons will work him out on April 11. Kicker John Lunsford -- 6-1 3/4, 213 -- had a 29-inch vertical and 9-foot-9 broad jump. He displayed a strong leg. He also did some punting, which surprised everybody. Wide receiver Darrin Peterson -- 6-1 3/8, 204 -- ran the 40 in 4.57 seconds against the wind and 4.4 seconds with the wind. He had a 35-inch vertical and 10-foot-2 broad jump. He did the short shuttle in 4.62 seconds and the three-cone drill in 7.0 seconds. He had nine reps on the bench. Peterson did a good job catching the football and could be a rookie free-agent pickup for an NFL team. Western Kentucky hosted its pro day on March 29, and was attended by Los Angeles Rams general manager Les Snead. Quarterback Brandon Doughty -- 6-3, 214 -- had a really good pro-day workout. He displayed accuracy, and was on point with his deep balls. Doughty's arm strength seems to have increased since the end of the season. Tight end Tyler Higbee -- 6-5 5/8, 251 -- had surgery on his left knee 14 weeks ago, so he didn't participate in the runs or jumps. He did do 18 bench-press reps. Higbee is estimated to be about 70 percent back to normal. He will be a draft choice. Defensive back Prince Charles Iworah -- 5-9 7/8, 192 -- ran the 40 in 4.32 and 4.36 seconds. He had a 38 1/2-inch vertical and 10-foot-8 broad jump. He did the short shuttle in 4.52 seconds and the three-cone in 7.12 seconds. He performed 25 reps on the bench. Iworah is described as being raw with not a lot of football experience. 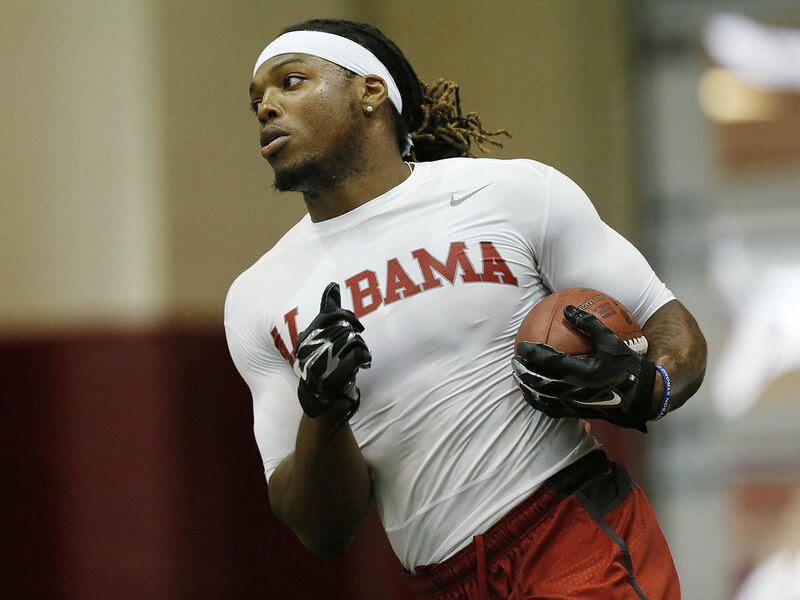 However, he's outstanding when it comes to pro-day numbers and looked good in the workouts. He could be a priority free-agent pickup. Representatives from 13 NFL teams attended Midwestern State's pro day on March 29, when 10 players worked out outdoors and on FieldTurf. Strong safety Marqui Christian -- 5-10 5/8, 196 -- has a chance to be a late-round draft pick or priority free-agent pickup for a team following the draft. He did the 40 in 4.46 seconds with the wind and 4.62 seconds against the wind. He had a 35 1/2-inch vertical and 10-foot broad jump. He did the short shuttle in 4.27 seconds and the three-cone in 6.85 seconds. He performed 14 reps on the bench. Cornerback Dominique Rouse -- 5-9 7/8, 173 -- ran the 40 in 4.54 seconds with the wind and 4.62 seconds against the wind. He had a 35 1/2-inch vertical and 10-foot-3 broad jump. He did the short shuttle in 4.4 seconds and the three-cone in 6.97 seconds. He also had 14 bench-press reps. There are some medical concerns for Rouse, so he's a free-agent possibility. Illinois State held its pro day on March 23, when nine Redbirds players and three more from area small schools worked out outdoors and on FieldTurf. Running back Marshaun Coprich -- 5-8, 207 -- had a 39-inch vertical and 9-foot-6 broad jump. He did the short shuttle in 4.42 seconds and the three-cone in 6.9 seconds. Coprich was a very productive player at Illinois State, rushing for 1,967 yards and 23 touchdowns in 2015. Cornerback Josh Burch -- 5-11, 184 -- ran the 40 in 4.51 seconds with the wind and 4.65 seconds against the wind. He had a 41-inch vertical and 10-foot-10 broad jump. He did the short shuttle in 4.34 seconds and the three-cone in 7.13 seconds. He did 13 reps on the bench. Burch has a chance to be rookie free-agent pickup. Defensive end David "Boom" Perkins -- 6-2 3/8, 230 -- was unable to run the 40 due to a left hamstring strain. He had a 37-inch vertical and 10-foot-1 broad jump. He did the short shuttle in 4.32 seconds and the three-cone in 6.82 seconds. He performed 21 reps on the bench. While Perkins played defensive end at Illinois State, his best position in the NFL would be linebacker. Quarterback Tre Roberson -- 6-0, 205 -- had a 37 1/2-inch vertical and 10-foot-1 broad jump. He also did 14 bench-press reps. Roberson was a college quarterback, but is switching to defensive back to give himself a shot at the pros. Representatives from 15 NFL teams -- including a defensive line coach from the Cincinnati Bengals -- were on hand for Central Arkansas' pro day on March 17, when 10 players worked out indoors and on FieldTurf. Defensive end Jonathan Woodard -- 6-4 7/8, 271 -- ran the 40 in 4.88 and 4.89 seconds. He had a 34-inch vertical and 9-foot-9 broad jump. He did the short shuttle in 4.4 seconds and the three-cone in 7.08 seconds. He performed 28 reps on the bench press. Woodard worked out really well. He wasn't invited to the NFL Scouting Combine, but probably should have been. Representatives from 24 NFL teams -- including a defensive line coach from the Minnesota Vikings -- were on hand for Florida International's pro day on March 31. A total of 13 players -- two of whom are rookie free-agent possibilities -- worked out outdoors and on FieldTurf. Cornerback Richard Leonard -- 5-7 3/4, 175 -- ran the 40 in 4.52 and 4.49 seconds. He had a 35-inch vertical and 10-foot broad jump. He did the short shuttle in 4.25 seconds and the three-cone in 6.9 seconds. He has really outstanding quickness and can cover well, but he's just small. Defensive tackle Lars Koht -- 6-5, 279 -- ran the 40 in 5.25 and 5.22 seconds. He had a 29-inch vertical and 8-foot-11 broad jump. He did the short shuttle in 4.56 seconds and the three-cone in 7.3 seconds. He performed 20 reps on the bench press. Koht was worked out by the Vikings coach in attendance. Representatives from nine NFL teams attended Jackson State's pro day on March 23. Six players from Jackson State, plus 11 more from small schools such as Bellhaven, Mississippi Valley State, Mississippi College and Delta State, worked out indoors and on FieldTurf. Cornerback Robert Porter -- 5-9 5/8, 189 -- ran the 40 in 4.64 and 4.52 seconds. He had a 36-inch vertical and 9-foot-9 broad jump. He did the short shuttle in 4.1 seconds and the three-cone in 7.0 seconds. He had 22 reps on the bench. Porter is a free-agent possibility.